Predictably. If the iPad first generation has seen some dedicated accessories keyboard / dock which had been spoken here, there will not be the same for the iPad 2. It's Phil Schiller, repeated here, which indicates a client Apple hint. Asked whether a keyboard dock special is planned for the iPad 2, Phil responded that most users prefer to use the keyboard iPad Touch and in other cases they prefer the BT wireless keyboard to used with Apple iPad, iPhone and Mac! One can imagine that sales have not necessarily been the rendezvous for the keyboard dock and an Apple iPad has decided not to renew the experience. You had already spoken, we do not recommend this keyboard at all, less versatile than the BT wireless keyboard and especially complicated to carry with its dock protruding on top. 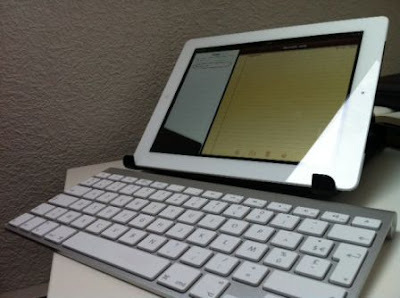 Otherwise, for fans of keyboards, you should see the arrival of keyboard cases built in the iPad 2 as we have seen for iPad 1 here or there, with unfortunately too rare availability QWERTY version.